The Lagos State Government has arrested eight suspected prostitutes and three men in the house of late National Security Adviser, Gen. Andrew Owoye Azazi in Ikoyi area of Lagos, Southwest Nigeria. The arrest was part of the Lagos State Government’s clean up exercise in Ikoyi and Victoria Island which have been overtaken by illegal and abandoned structures. 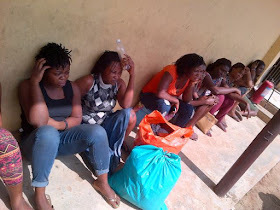 Officials of the Lagos State Taskforce on Environmental and Special Offences (Enforcement) Unit and the police from Ikoyi Police Station stormed Azazi’s abandoned house at 5 Club Road, Ikoyi and arrested eight suspected prostitutes plying their trade in the area, along with three other men. Most of the young women arrested were from Benue State and will be charged to court by the taskforce for constituting nuisance in the area. “I don’t know anything happening in the compound until Saturday when they came to arrest us by police from Ikoyi Police Station, they released us to come back and pack our things, when we were inside to pack our loads, they came back and arrested us again. Nobody has come to warn us to stay away from there,” said Patience Ajoke, one of the suspected prostitutes. Mary Augustine, a 20-year old suspected prostitute from Benue State told our correspondent she was arrested because she was staying at Azazi’s house, saying she was not a prostitute but a cleaner. But Taskforce chairman, Yinka Egbeyemi said the women were prostitutes and had turned Azazi’s house into a prostitute den. “We have been there once with the DPO of Ikoyi Police Station. They sell ‘paranga’ in that place,” saying that policemen and soldiers were always seen at the place patronizing them, adding that the people living in that place had been told to vacate the place long ago, but that they refused to leave. “During the clean up exercise, we were asked to move there again. We saw policemen and military men there and all sort of human beings. They are doing prostitution business there. We are going to charge them to court,’ he said. Egbeyemi said the clean up exercise was ongoing and would be total, adding that the state government had issued ultimatum to owners of abandoned properties in Ikoyi and Victoria Island to rehabilitate them or forfeit them to the government.